Chromatin organization changes dramatically during the cell cycle. During interphase (G1, S and G2 phases), a large part of the chromatin remains loose and non-condensed (euchromatin), and the other part appears in a condensated state (heterochromatin). There are chromatin regions that can alternate between condensed and non-condensed states during the normal behavior of the cell. Many genes have to be expressed during interphase, and they need to be accessible to RNA polymerases and transcription factors, which is easier in a less condensated state of the chromatin. However, during mitosis (M phase), chromatin achieves a highly degree of compaction and organization to form chromosomes. Segregation of chromosomes between the two daughter cells is a very important process during cell division. The condensation of chromatin to form chromomas is consequence of histone modifications. 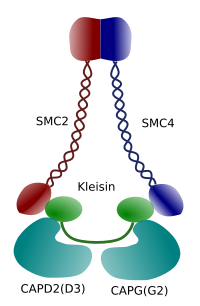 In addition, a group of proteins known as SMC (structural maintenance chromosome) are involved in this compaction mechanism. 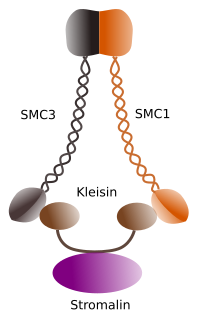 Cohesins and condensins are SMC proteins. Figura 1. Structure and molecular composition of cohesin SMC 1 and 3 (image prepared by Ángela L. Debenedetti y Daniel García, Biology students . Adapted from Barbero 2009). The first function granted to cohesins (Figure 1), and that is why their name, is to keep sister chromatids together along the cell cycle untill they are separated in anaphase. In Saccharomyces cerevisae, a yeast, cohesin complexes are attached to chromatin in G1 and S phase, at the same time that DNA is been replicated. This proces is known as "loading", and is ATP dependent. During mitosis, a correct order of chromosomes in the metaphase plate is essential. It is also crucial the lost of cohesion between sister chromatides that allows the migration of each chromatid to opposite mitotic spindle poles during anaphase. This mechanism of instant and coordinate segregation is possible because choesins stop linking sister chromatids between each other. The process must occur in all chromosomes at the same time and it must be coordinated with the microtubule motor proteins movements and polymerization and depolymerization of microtubles of the spindle pole. Separation of sister chromatids and microtubule-related activity happening at the same time is the result of the convergence of two molecular pathways that are initiated by the activity of the cyclin M dependent kynase enzyme, M-CdK. At the beginning of mitosis, cohesins make links between sister chromatids, along the whole length of chromatids (Figure 2). M-CdK phosphorylates kleisin, a component of cohesins (Figure 1), during prophase and prometaphase, leading to the dissociation of cohesins from chromatid arms but remaining at the centromere region. Thus, chromatids remain attached through centromeres. Phosphorylation of centromere cohesins is prevented by the PP2A phosphatase, which is associated with this region. In this way, chromosomes (sister chromatids attached through centromeres) are lined up in the metaphase plate. Figure 2. Cohesin function during mitosis. Cohesins keep sister chromatids attached from prophase to anaphase. 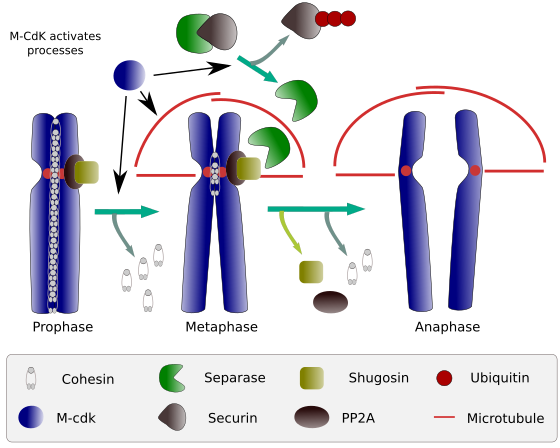 M-CdK starts three molecular processes that converge in the M phase: it stimulates the formation of the mitotic spindle, disconnects cohesins located outside centromes, triggers the separase-securin complex, allowing separase to remove shugoshin-PP2A, which maintains centromeres together thanks to cohesins, and then anaphase is able to start (image prepared by L. Debenedetti y Daniel García, biology students, adapted from Barbero 2009). During the first stages of mitosis, M-CdK phosphorylates the complex APC (anaphase promoting factor) that splits the separase-securin complex. M-CdK also phosphorylates proteins that makes possible microtubules and proteins of the mitotic spindle to drag and separate the sister chromatids, once chromatids are disengaged between each other. These forces are performed during the mitosis time. Choesins are also mayor players in the chromosome movement during meisois. The behavior of chromosomes during meiosis is much more complex than in mitosis, and so do is the function of cohesins. During the first mioitic division, cohesins are linking both the sister chromatids (arms and centromeres) and homologous chromosomes, keeping the bivalent chromosomes together for the proper lining up in the equatorial plate of metaphase I. At the beginning of anaphase I, mediated by separase proteins, cohesins detach from both the chromosome arms or sister chromatids and chromatids of homologous chromosomes. Again, cohesins of centromeric regions remain attached. Each homologous chromosome, with the two sister chromatids, migrates to oposite spindle poles. In this way, the first meiotic division ends. In the second mioitic division, in prometaphase II, the kinetochores of each chromosome get attached to microtubules coming from opposite spindle poles, respectively. Cohesins are still linked to the centromeric regions. In prometaphase II, at least in mammals, microtubules cause mechanical forces in the centromere regions leading to relocation of PP2A phosphatase from centromeres and, mediated by separase proteins, the cohesin release from centromeres. It happens during metaphase II/anaphase II transition. As happened in mitosis, sister chromatids are freed and can be moved to oposite spindle poles to form haploid cells. Cohesins have been involved in other functions like DNA repairing, control of gene expression, and with different new roles in biochemical processes non-related with chromosome behavior during M phase. Figure 3. Structure and molecular composition of a condensin (image prepared by Ángela L. Debenedetti y Daniel García, Biology students . Adapted from Maeshima y Eltsov, 2008). Condensation of chromatin in chromosomes is good mechanism for withstanding the traction forces working in mitosis during methaphase and anaphase. Furthermore, it would be difficult a correct distribution of chromatin between daughter cells if DNA were loose and evenly distributed through the nucleus. There would be a massive entangling of DNA strands that would hamper the DNA integrity and an equal allocation between the two new cells. Condensins (Figure 3) are involved in the chromatin condensation. In vitro experiments have shown that condensin induces DNA tension by an ATP-dependent mechanism. First, helped by topoisomerase I enzyme, condensin produces DNA super-coiling. Secondly, it promotes the formation of chromatin loops, in collaboration with topoisomerase II. These processes are thought to occur in prophase of living cells too. Condensin SMC dimer may increase the angle that SMCs form between each other and then contact with distant chromatin regions through the molecular head domains of each SMC. After that, the dimer structure gets back to the initial position, generating in this way a traction force that drags the DNA that gets folded in a loop (Figure 4). 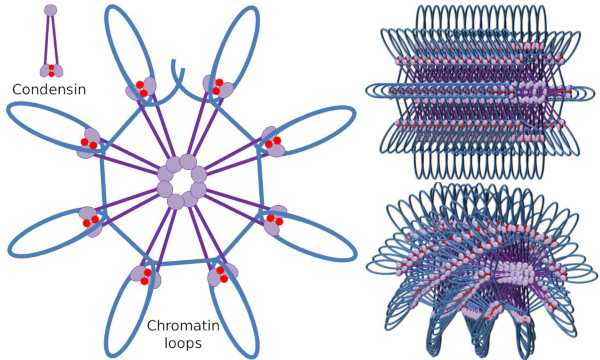 By interactions of SMC dimers of different condensin molecules, higher order molecular-chromatin complexes are formed and organized in rings or loops. This mechanism leads to the emergence of mitotic chromosomes. Figure 4. Loops formation by condensins (image of the right). Blue line is DNA. Images on the right try to represent the effect of condesins on the tridimensional organization of chromatin. Notice that the molecular regularity depicted here are not probably found in the real world (images prepared by Ángela L. Debenedetti y Daniel García, Biology students. Adapted from Maeshima y Eltsov, 2008). All organisms, included bacteria, have some type of condensin. Fungi only have type I condensin, algae have two types, and C. elegans has three types. Most animals and plants have types I and II condensins. In HeLa cell lineage, type I and II are equally abundant (1/1), but in Xenopus is 5/1, and 10/1 in chicken. Condensins I and II participate in different stages of chromosome condensing. Condensin I mostly works on chromosomes during prohase and leave them in telophase. In interphase, condensin I is found in the cytoplasm during G1, but may later disappear. Condensin II is associated with chromatin in interphase and concentrates in chromosomes during prophase. Its function is not clear yet, although it would have influence the chromatin organization. Condensin II is involved in the early stage of chromosome compaction, whereas condensin I, helped by condensin II, would give shape and stability to chromosomes in a more advance step of the condensing process. Differential spatial and temporal distribution of both condensins affect their access to chromatin. Thus, initial condensation of chromatin during prophase is produced by condensin II, after it is phosphorylated by several kinases. 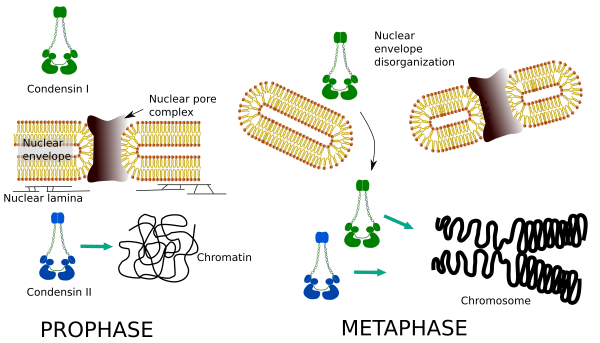 At the end of prophase, the nuclear envelope is disorganized and condensin I, which is located in the cytoplasm, is allowed to access the chromatin. Then, both condensins can cooperate in condensing chromatin to reach the compaction levels found in chromosomes (Figure 5). Figure 5. Roles of condensin I and II in different stages of mitosis. (Images prepared by Ángela L. Debenedetti y Daniel García, Biology students. Adapted from Ono et al., 2004). Condensins do not attach to the chromosome randomly. They have more affinity for centromeres, telomeres, genes, and DNA regions for beginning and ending the transcription. So, it appears that their function is not only structural. In addition, condensin I specifically binds H2A and H4 histones during mitosis. Although chromosomes of vertebrates are hable to condensate almost spontaneously, lacking condensins leads to loose the organized structure during anaphase. Moreover, after M-CdK activity ends during anaphase, condensin appears to be needed for make sure a correct migration of chromosomes to the spindle poles. Condesins roles in during meiosis has yet to be carefully studied, and there is no much data about it so far. The functions of condensin II are uncovered after the study of mutant cells lacking condesins. These cells show longer and bend chromosomes caused by a poor axial condensation. Chromatids look more entangled, even in anaphase, and prophase is shorter. When condensin I is lacking, there is weak lateral condensation of chromosomes, cytokinesis fails and cells become polyploids. Condensins are also involved in the regional chromatin condensation during interphase. It can be modulated how easy is for the transcription set of molecules to gain access to a particular gene by changing the compaction level of chromatin. More compact means more difficulty. It looks like this regulatory mechanism of chromatin compaction is not based in the same molecules that acts during chromosome compaction, although condensins are participating in both. Condensins and cohesins may perform several functions independently from each other, but both protein families work together during mitosis (Figure 6). Figure 6. Condensins and cohesins working together during chromosome formation. (Images prepared by Ángela L. Debenedetti y Daniel García, Biology students. Adapted from Maeshima and Eltsov, 2008). Barbero JL. 2009. Cohesins: chromatin architects in chromosome segregation, control of gene expression and much more. Cellular and molecular life sciences. 66:2025-2035. Maeshima K, Eltsov M. 2008. Packaging the genome: the structure of mitotic chromosomes. Journal of biochemistry. 143:145-53.